To say technology continues to advance the modern workplace is a massive understatement. Just as desktop computers, word processing, and intranet systems provided immense leaps in efficiency, productivity, and agility over the last few decades, today’s work environment is in a continual process of reinvention, enjoying similarly impactful benefits from immediate, flexible messaging apps like Slack and Workplace by Facebook. Such messaging apps are growing in popularity by the day, with Slack alone accounting for over 6 million daily users and Facebook's entry into the space already amassing 14,000 organizational users and 400,000 distinct groups. As a far more streamlined alternative to the never-ending conversational email chains that too often get lost in the swamps of a typical inbox, messaging apps like Slack offer a far more organized, collaborative, and sleek interface for employees that boost productivity with simplicity and speed. Given the overwhelming popularity of messaging apps like Slack, companies can leverage that existing familiarity between the app and an employee base to further streamline their employee engagement and feedback mechanisms. By integrating feedback systems directly into the organization’s current messaging app of choice (such as a Workplace or Slack bot survey or poll), employees will already feel comfortable with the app's interface and, along with its inherently convenient functionality, will naturally be more apt to participate in the feedback process. Of course, greater and more thorough participation rates lead to additional data points for the employer, increasing the overall effectiveness of their employee engagement and feedback insights. 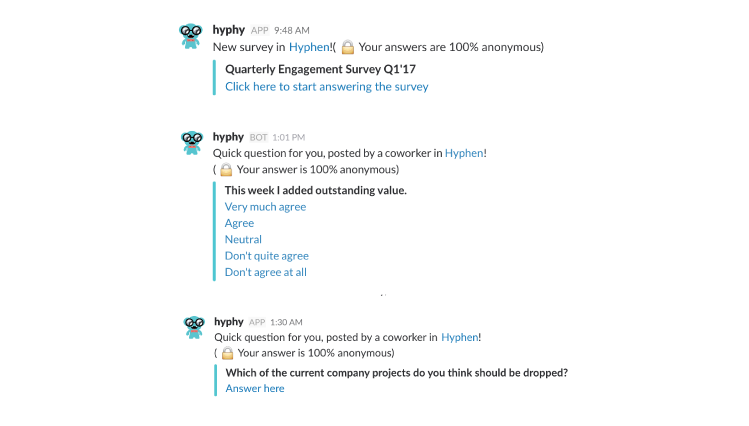 Hyphen's Slack bot survey tool, "hyphy." Obviously, no two organizations are exactly alike so for some, retaining a devoted employee feedback mobile app or even gathering feedback through traditional channels like email or web will remain a viable option. However, when the opportunity presents itself, companies are best served to simplify the process and decreasing friction as much as possible to, as stated before, increase participation and provide management more accurate people data. If Slack, specifically, is already being used, the interface displays a notification when employees receive a message requesting feedback, further expanding participation rates simply out of convenience and familiarity. The combination of Slack and a well-integrated employee engagement system can significantly increase the speed of the feedback cycle while also enhancing communication throughout all levels of a company, both of which are critical components of creating a strong and healthy company culture. At Hyphen, we have embraced Slack’s popularity by seamlessly integrating it into our platform, providing clients already using Slack a remarkably efficient feedback channel that has proven to be instrumental in significantly boosting participation rates in feedback systems across the board. Since employees receive notifications on the Slack interface itself, many are able to quickly send HR their responses to our Slack bot surveys and polls and, therefore, greatly shorten the feedback cycle. Since management receives the resulting people data faster than systems lacking Slack integration, they can react faster to any rising trends that might ultimately impact productivity, particularly when coupled with the analytical tools provided by Hyphen's Smart Insights feature. 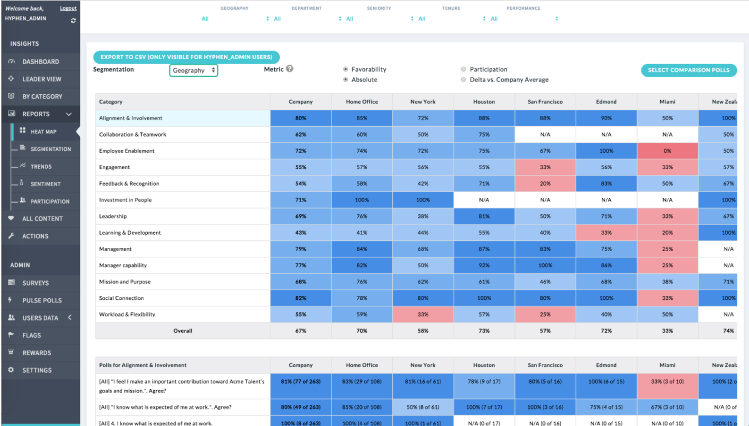 Between the accelerated pace of feedback systems employing Slack’s existing interface and the people data insights uncovered by Hyphen, companies have a quick, agile, and incredibly prescient feedback solution set that is both nimble and comprehensive enough to keep pace with an ever-evolving workforce. Pre-digested insights for Senior management and Mid-level managers alike. Dynamic reports and filters help focus on the right issues for each employee group. Sentiment analysis (NLP-based) is run on all text answers to quickly get to the root cause of employee issues. Aside from its prevalence in the current workforce, many of Slack’s unique features also naturally lend themselves to more efficient and beneficial feedback systems. Slack channels, for instance – a feature behind the platform's growing popularity – allow companies to organize conversations, and in this instance, employee feedback by specific types, including particular departments, teams, locations, and a variety of other categories. Likewise, organizations can establish dedicated Slack channels for open-ended, crowd-sourced feedback that provides management with authentic responses needed for true insight. However, organizing and analyzing this group feedback through Slack channels can prove to be difficult, especially for large organizations. 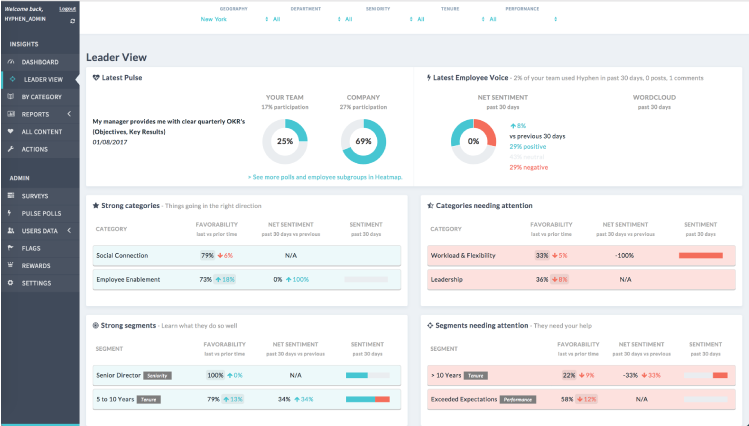 Hyphen’s open-ended feedback feature, Employee Voice, can offer the same group feedback mechanism as Slack, but with the added benefit of Hyphen analyzing this feedback for actionable insights. The fact that surveys and pulse polls in Slack can be anonymous is a powerful tool within an overarching employee feedback system. As we've previously discussed at length, anonymous feedback is vital in improving employee engagement and elevating honesty in responses, easing employee anxieties and fostering innovative thinking. When using an anonymous Slack bot survey or poll, employees are assured their feedback will go directly into that anonymous channel rather than being funneled through company email, management, or HR. Of course, with a more honest source of feedback provided by anonymity, management will likewise have more accurate data to improve the decision-making process as well as nearly every other facet of the organization, including culture, training, management, and operations. However, when establishing an anonymous Slack feedback strategy, it is still of utmost importance for companies to create and maintain guidelines so respect, honesty, confidentiality, and fairness are retained throughout the process. Alternatively, from a more collaborative perspective, companies can also collect feedback from Slack groups to take advantage of a more team-oriented, groupthink-based set of opinions. Like an anonymous channel, however, similar guidelines are needed to keep proper etiquette within the group feedback channels. When implemented in a healthy, productive manner along with management's active participation, group channels will provide company leaders yet another source of actionable insights as long as discussions don't get stuck on contentious issues with no resolution in sight. When this occurs, table such issues for a later time to prevent the process from bogging down and losing its impact. Again, organizing and analyzing this group feedback over the long term can be difficult, so be sure to consider moving these conversations to a more robust employee feedback solution like Hyphen. Messaging apps like Slack have already proven to be instrumental in creating effective, immediate communication across organizations. When combined with Hyphen's innovative solutions that maximize the insights gathered from effective feedback systems, organizations can realize significantly enhanced abilities to collect and analyze people data, identify issues, and reveal important insights needed to make decisions that impact the entire company and its future success.